Ear hair is one of those things that everyone sees but no one likes to talk about. Once you notice it, it is impossible to forget. This is definitely an embarrassing result that men face as they age. Luckily, they don’t have to deal with it anymore! 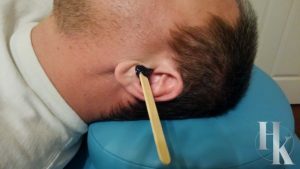 Men can now get their ear hair waxed out and be worry free for a month. How Does Ear Hair Waxing Work? At HK Wax Center – Austin Arbor, we only use hard wax. This means there is no paper strip required to be placed on top of the wax. Instead, the wax will harden of its own. First, wax will be applied to the outer edge of the ear. Then we will take a little ball of wax on the end of a popsicle stick, and place it slightly inside the ear. Obviously, we don’t want to go inside the ear canal because those inner hairs are there to help protect you. Ear waxing is the best option for removal since the hair will be pulled from the root. This means you won’t have to deal with the hair for a month. A lot of men that wax their ear hair will also add a nose hair waxing as well. Please leave ear hair removal to the professionals, wouldn’t want to remove something you’re not supposed to!